The Torah states that Avraham, Sara, Yitzchak, Rivka, Yaakov and Leah are all buried in Machpelah Cave. According to tradition, Adam and Chava were buried there as well. Avraham’s purchase of this property to bury Sara was the first concrete action that established a Jewish connection with a particular site in Eretz Yisrael, and upon his death he is also buried in this place. Although the entire Land of Israel was promised to the Children of Israel, there are three key places that were actually purchased, in order that they could never be accused of having taken possession of them inappropriately. 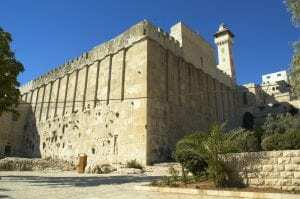 Avraham purchased the Cave of Machpelah, Yaakov bought Yosef’s burial plot in Shechem (Genesis 33:19) and King David paid for the site of the Beit Hamikdash (II Samuel 24:24). While we are fortunate that we can actually visit the Cave of Machpelah today, sadly, Jewish authority over Chevron, Shechem and Har Habayit, is disputed by much of the world. We pray for the time when the biblical record will be recognized and respected by the nations. At that time, before Jesus, a persons spirit ( soul) entered Sheol. Abraham having been the father of many, seems to be the same in Sheol, as we read the story of the rich man and Lazerus the poor man, being in Abraham's bosom. We read that He who ascended also descended. During His three day's and night's, Jesus preached the "Good News" that He made a way to the Father, destroying Sheol and in His Ascension brought "up" with Him ALL the Old Time Saints, as described when many saw hundreds ascend into Heaven. I'm assuming from the knowledge shown by ALL who comment that the exact Scriptures I'm speaking of are known. Also, The Scriptures mostly follow the lineage of Jesus, Ishmael's line is included a little bit showing the connection of the Arab's through his father. Unfortunately the two have always been in conflict. Most importantly we no longer go " into the pit", because Jesus has made " the way" to the Father when He defeated Death!!! We should note that, Sarah, Rebekah and Rachel were all barren for a long while, and "The Lion of Judah" would/did come from Leah.Rachel's beauty ; it's mentioned that Rachel was fair eyed, probably means " blue-eyed" which set her apart from the dominating brown eye's of most Hebrew's. It would be amazing to travel to The Holy Land! To walk where all these incredible people once walked, it's a dream trip for me, but living in Florida I hope to visit The Holy Land Experience in Orlando. Maybe one day I'll get to actually visit the Real Holy Land even if it be yearly, to Mnt. Zion to worship and Fellowship within The New Jerusalem!! I think of Leah and Rachel from time to time, and wonder just how these sisters felt sharing a husband. One was beautiful and wanted, the other felt rejection and may not have been beautiful. Yet it is from the one rejected that many of the Israeli tribes have come. G-d understands rejection, people reject him today and go their own way, so he knew Leah's heart, the anguish she must have felt and how he blessed she and her line. Thank you Shira. That's really quite sad isn't it! There is a song on Israel Bible about Rachel and her cries. It's not an easy song to listen to, as you can almost hear her, even today. Re: verse 9, Ishamel is back? how did I miss that I wonder. So this means that at some stage of their lives there must have been some sort of peace between them. What do the wise Rabbis say about this? Ishmael does come back to bury his father Abraham along with his brother Isaac. In this verse, Isaac is mentioned before Ishmael. Rashi quotes the Sages of the Talmud who deduce from the fact that Ishmael lets Isaac go first that Ishmael actually repented from his evil ways. They further say that when the verse says that Abraham will be buried in good old age (Genesis 15:15), it is referring to the fact that Ishmael will repent in Abraham's lifetime.